We have stringent quality norms for all the raw materials being used. Every equipment being produced is checked with special online inspection module. Pre dispatch quality inspection is also done so as to conform to the quality standards we and our customers seek. We value our commitments and know the importance of following delivery schedule and quality norms. Our range of equipments include Belt Conveyors, Screw Conveyors, Bucket Elevators, Rotary Feeders, Slide Gates etc. 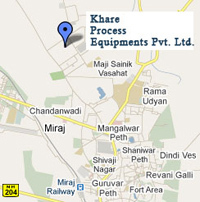 Khare Process Equipments Pvt. Ltd. is a part of diversified KHARE GROUP with following interests. We have state of art manufacturing facility at MIDC Miraj ( 250 Kms away from Pune towards South). Its well connected to the rest of the nation by National Highways and Railway Network. We at Khare Process Equipments Pvt. Ltd. will strive to design manufacture & supply quality products within time as per customer requirements and achieve improvement in our business through customer satisfaction continually.